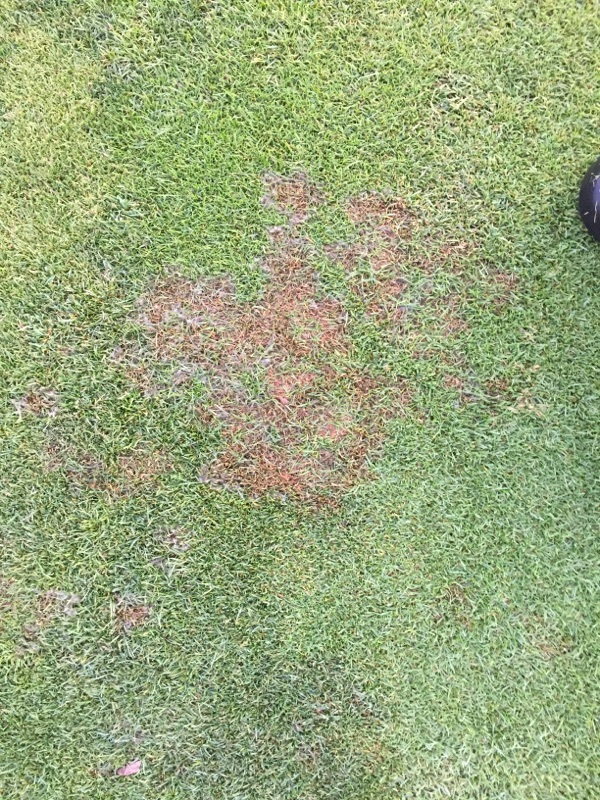 I’ve had a few questions this summer about bacterial etiolation and decline in bentgrass putting greens. 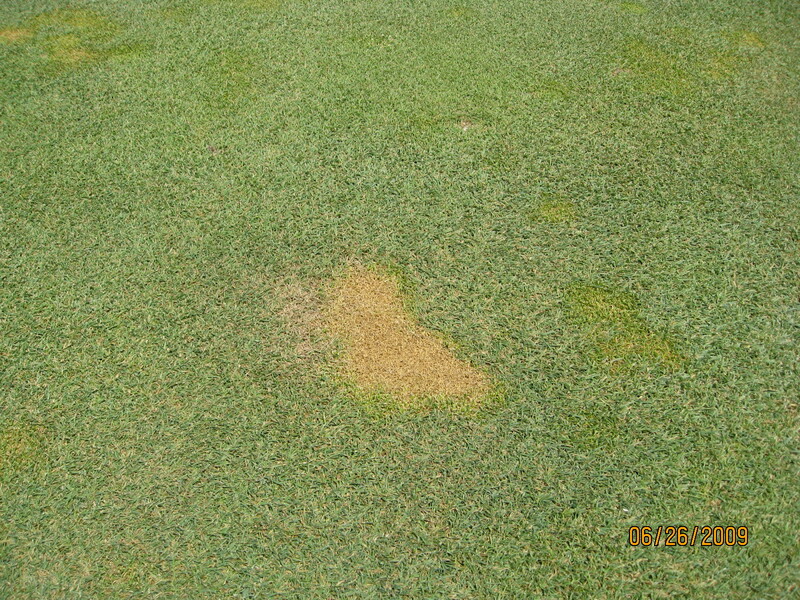 I routinely check for this disease but have not observed it this year in any samples submitted to KSU so far. A few days on Twitter I saw an excellent update from Dr. Rick Latin (Purdue University) about this disease. You can click HERE to read it. Those are two questions, flip sides of the same coin, that I hear every year. The answer to both is YES. 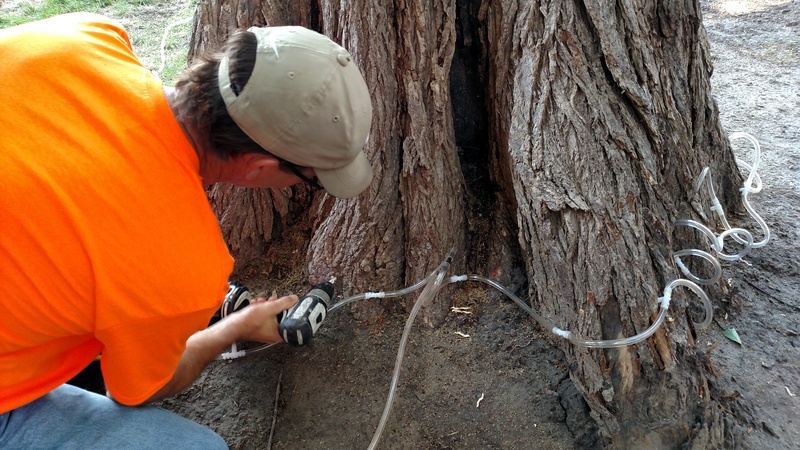 Judy O’Mara, Director of our Diagnostic Clinic, handles most of the tree samples and she has picked up DED in several samples this summer, like we do every summer. Sanitation (removing and destroying infected trees) is essential to DED management. 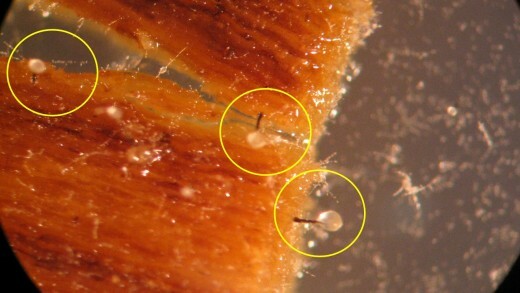 If infected trees are near other elms, root grafts need to be disrupted first. For nitty-gritty details on DED you can visit this page – click HERE. 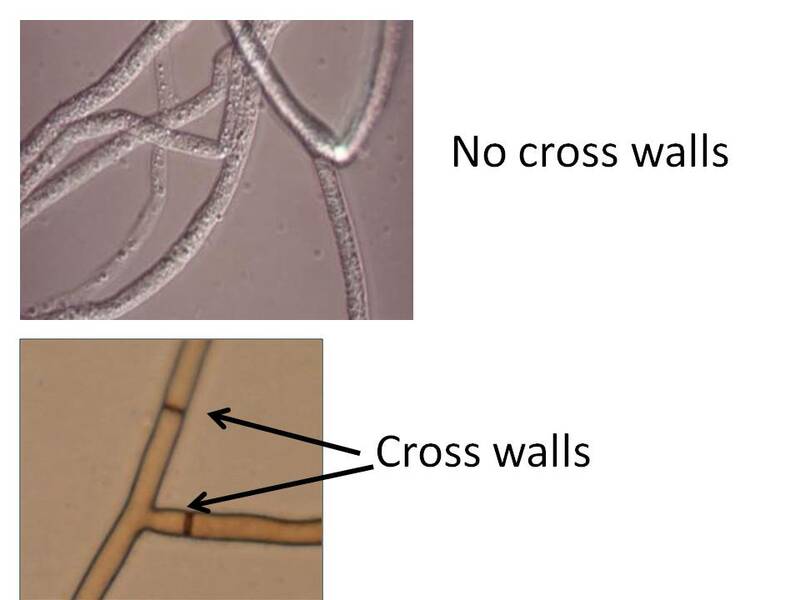 Here is a photo of the DED spore-producing structures in the dissecting microscope. 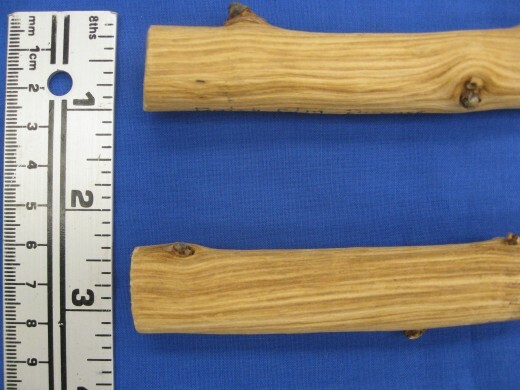 Dutch elm disease is caused by this fungus (actually two related fungi) which is spread by elm bark beetles. 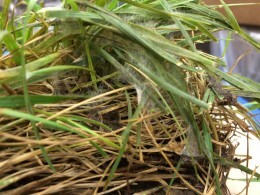 In the photo above, we see the black stalks and a creamy, gooey ball of spores at the top. The beetles pick up the spores and move them around from tree to tree. The fungus can also spread tree-to-tree in neighboring trees by root grafts. 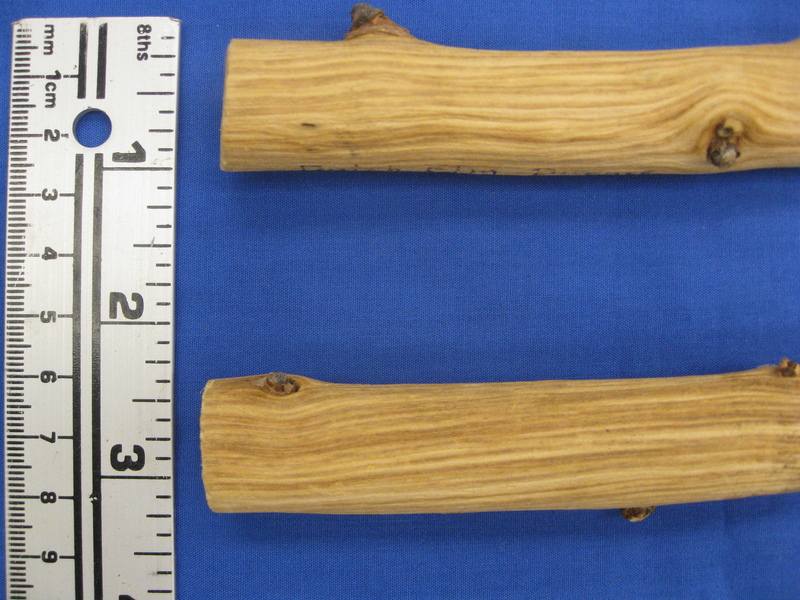 Initial symptoms are “flagging” of individual branches, especially when the disease was introduced by the beetles. The disease spreads over weeks or months through the rest of the crown. For high value elms, preventative fungicide injections (appropriately-labeled products of propiconazole or thiabendazole) are an option to reduce the risk of Dutch Elm Disease (though it is not a 100% guarantee). This can be one piece of the DED management system. Remember, sanitation is a key piece of reducing the risk of DED (See the link above). 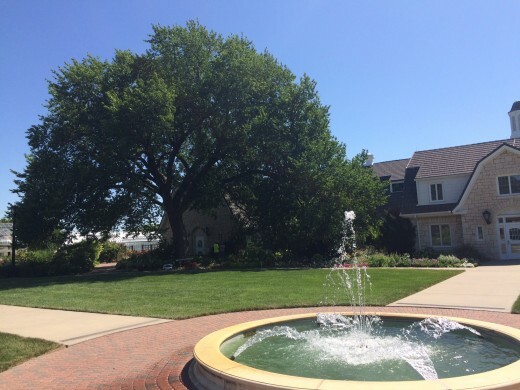 Here is a photo of the big elm at the K-State Garden. 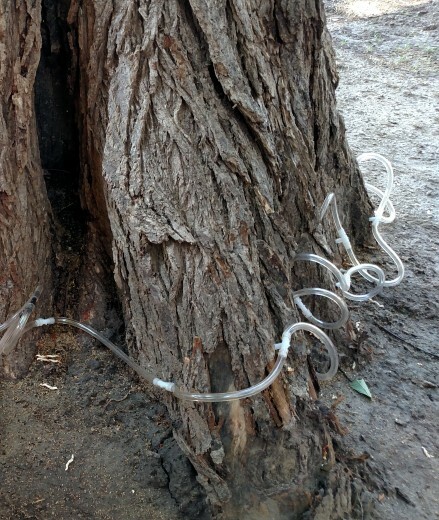 This tree is on a 3-year injection cycle. 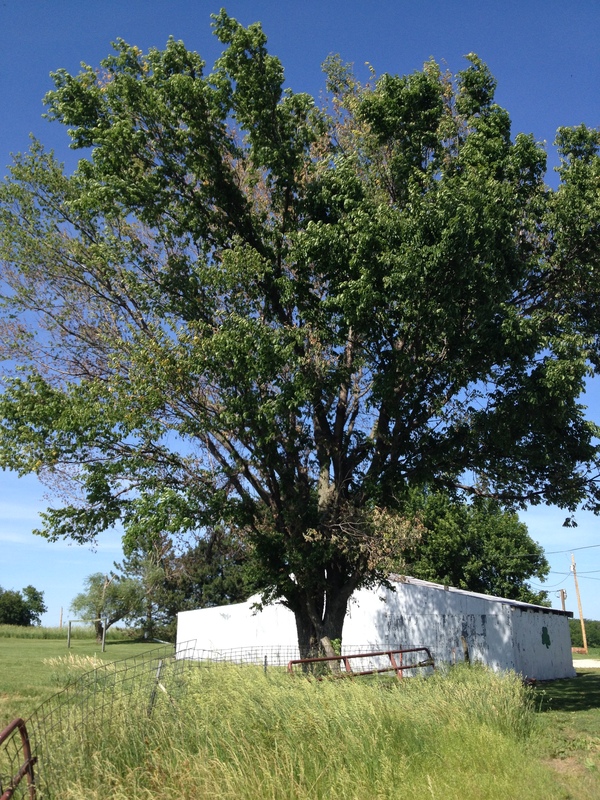 We thank Matt Giese from Syngenta for providing some Arbotect fungicide to inject this tree, and we thank Randy James, Consulting Arborist from Tree Biologics, for generously donating his time to inject the tree a few weeks ago. We use our injection days to educate students, Extension Master Gardeners, and others about DED. 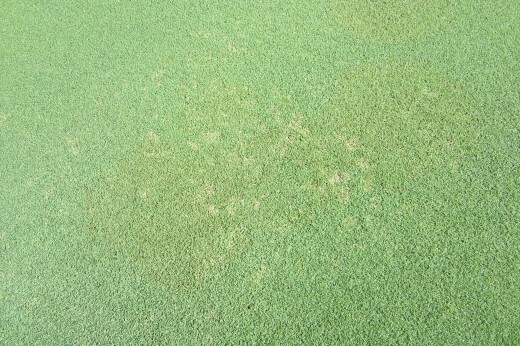 In the past we days we received a couple of samples of Pythium foliar blight (also called Pythium cottony blight). 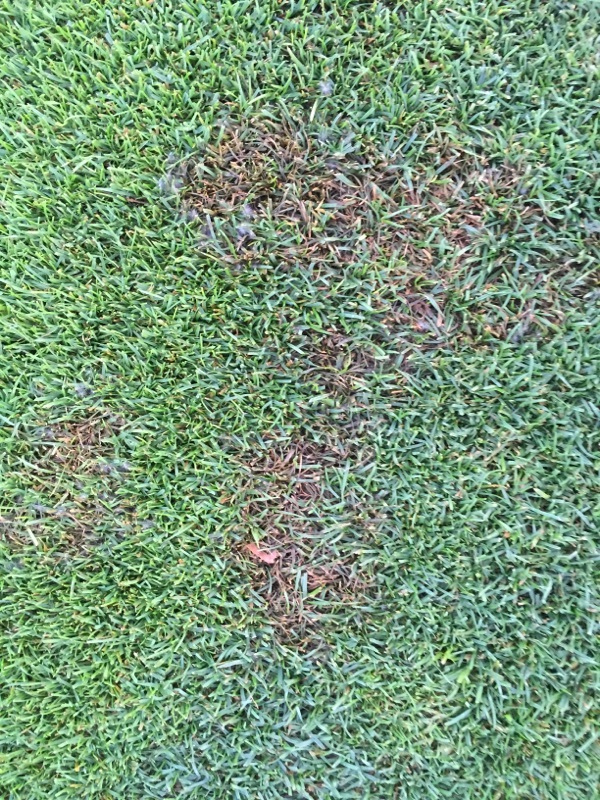 One was from a perennial ryegrass golf course fairway. In the photo above you can see the greasy, matted down appearance of the turf. With a handlens, or even just with the naked eye if you looked closely, mycelium was present. 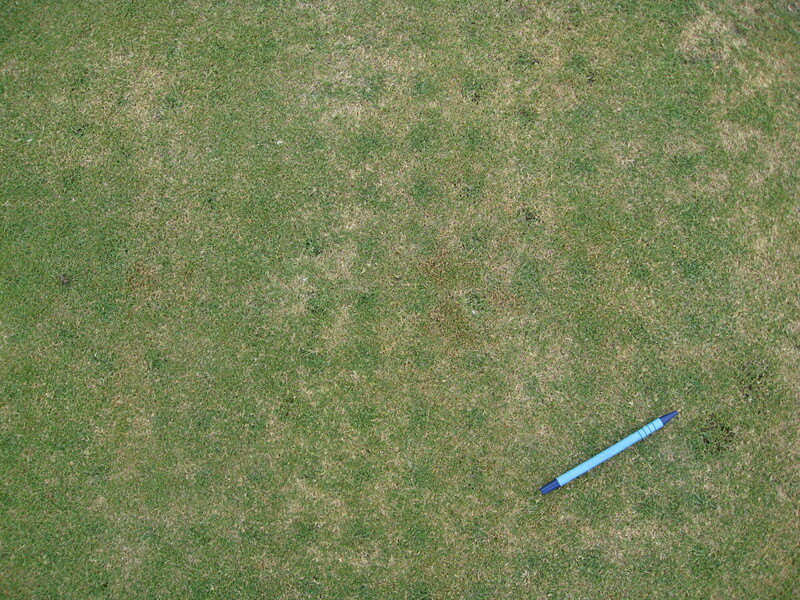 In the microscope it was clearly Pythium (see the tall fescue pics below). The second sample was from a tall fescue home lawn. 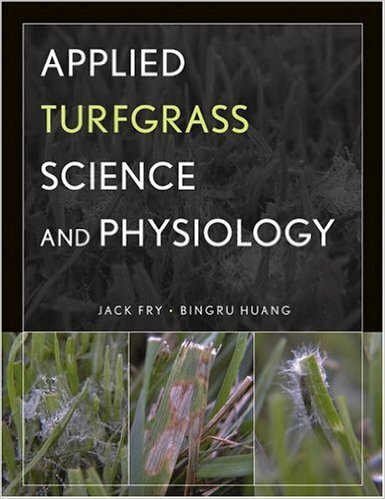 Usually we think about Pythium on ryegrass or creeping bentgrass, but it can attack other cool-season turfgrasses. 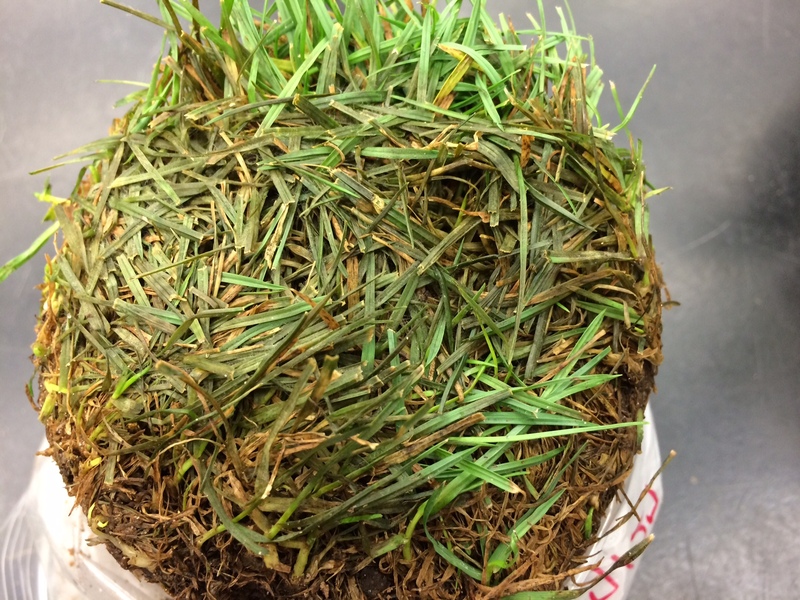 Tall fescue has more potential to recover than perennial rye or bentgrass. 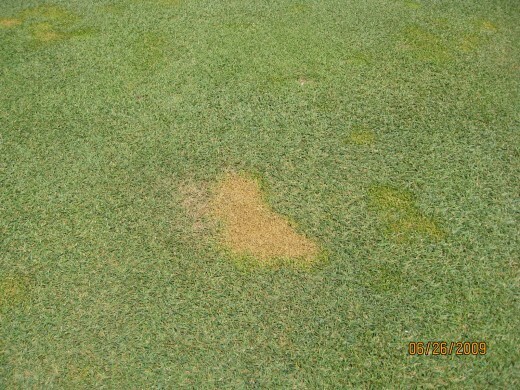 In 11 years, I have seen it on tall fescue only 1 or 2 two times before. Below is a photo of the greasy, matted-down tall fescue turf. 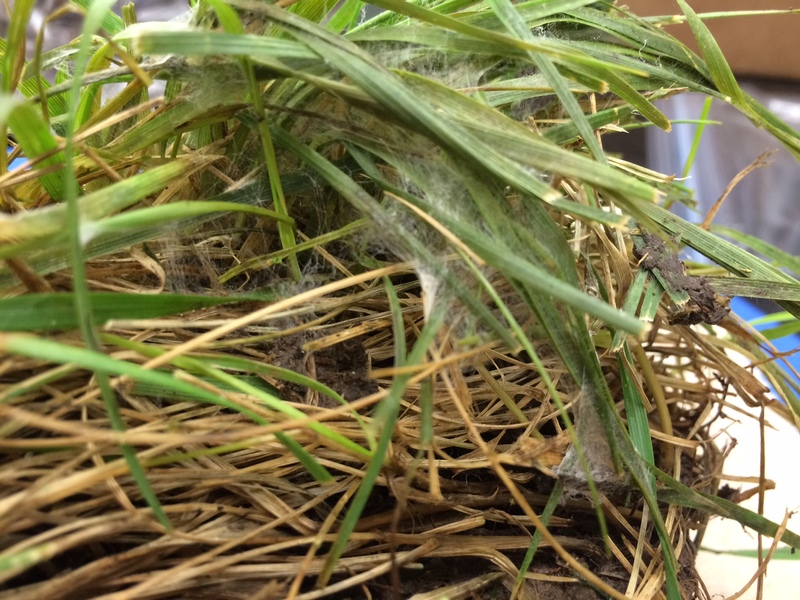 After incubating overnight in a plastic box with wet paper towel the mycelium was present. 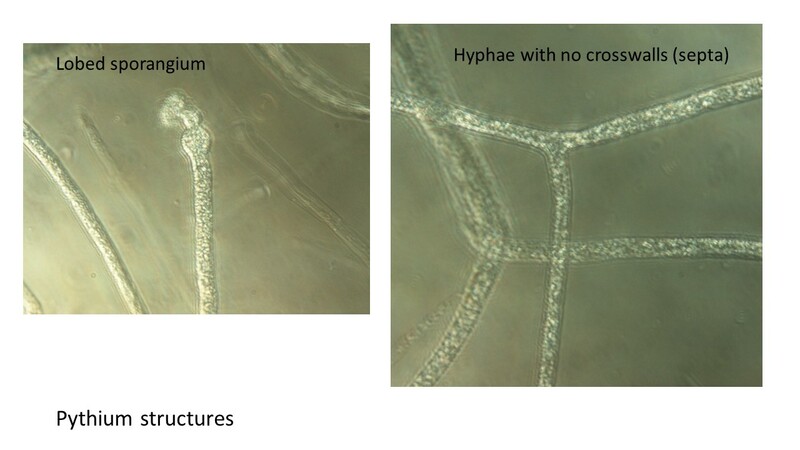 In the microscope, the pathogen was clearly distinguishable as Pythium. 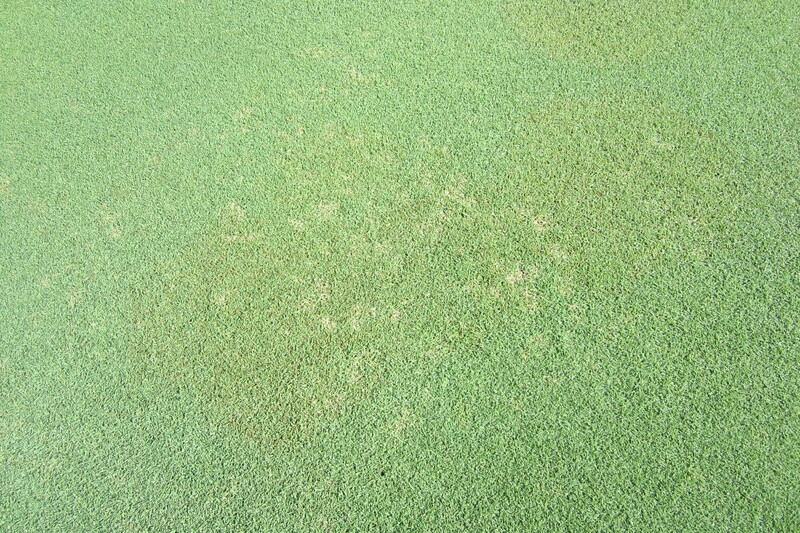 The pattern is different from brown patch, and brown patch lesions were not present. 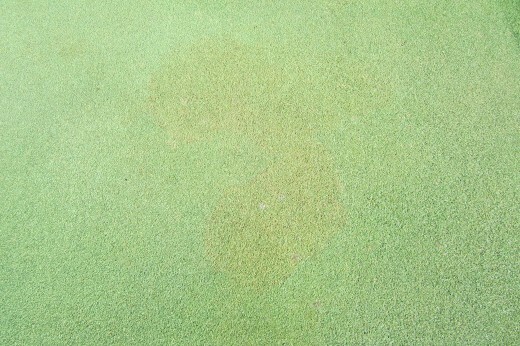 I have seen weird tracking patterns with fertilizer burn or other chemical injuries, too. It can be challenging to know what is what. If you have any doubt, send in a sample, and email some photos. 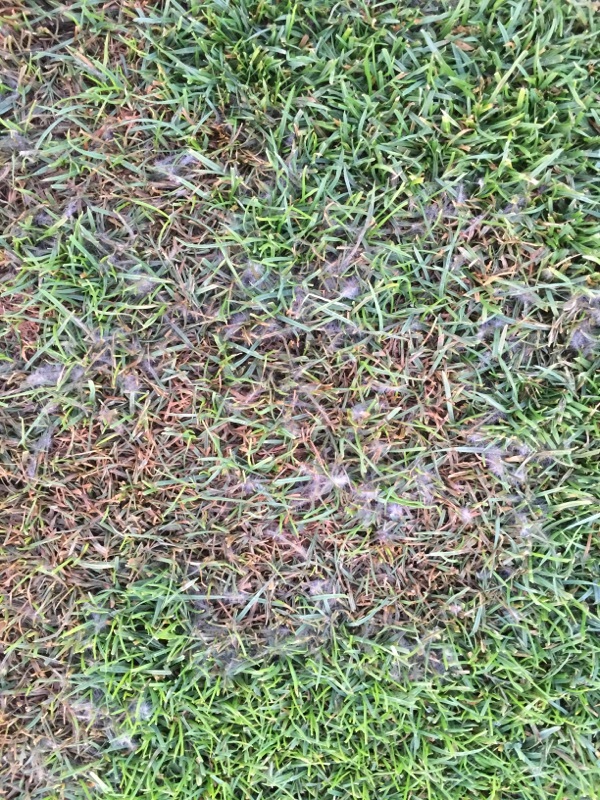 Pythium thrives in wet conditions, so avoid overwatering. Water deeply and infrequently, and avoid watering in the evening. Improve drainage and try to increase airflow and sunlight. 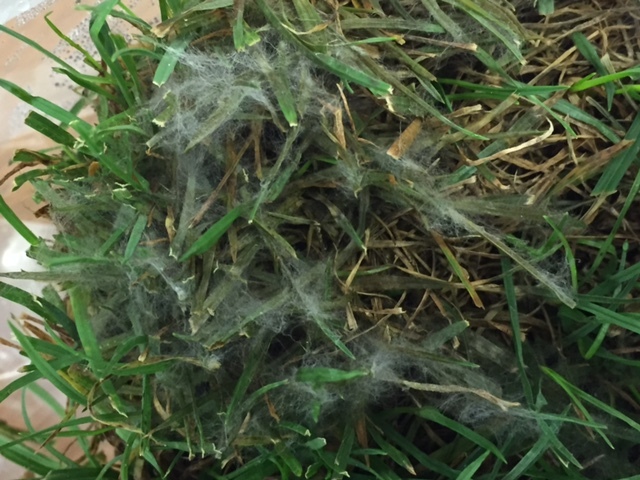 Avoid overfertilizing – Pythium loves an overly lush lawn. 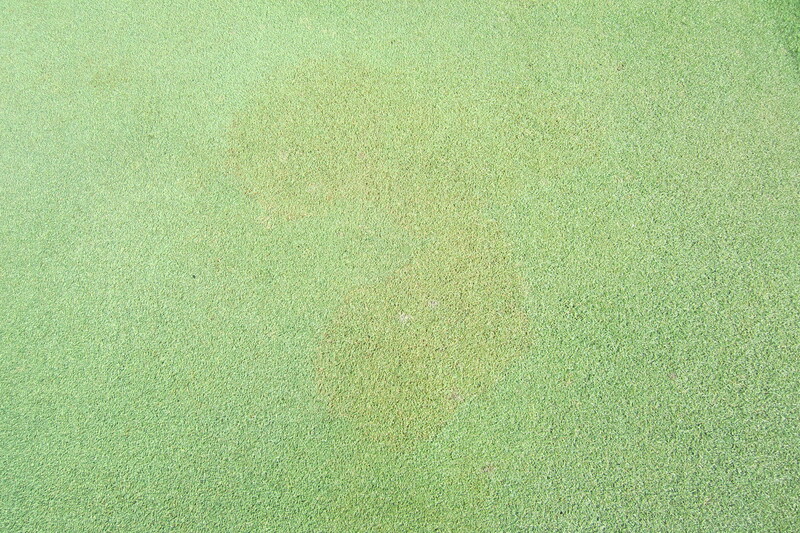 As a bonus, those practices will also reduce the risk of brown patch. It’s getting close to that time of year again – to start promoting available scholarship opportunities through the Heart of America GCSA. Please help spread the word to your students (when school starts in August). Deadline is October 31, 2016. The Heart of America GCSA Scholarship Program offers educational aid to deserving students in the turfgrass program at an accredited college or university in Kansas or Missouri. A total up to $5,000 is allocated each year to deserving students. Applicants will compete based on their overall qualifications determined by the Scholarship and Research Committee. 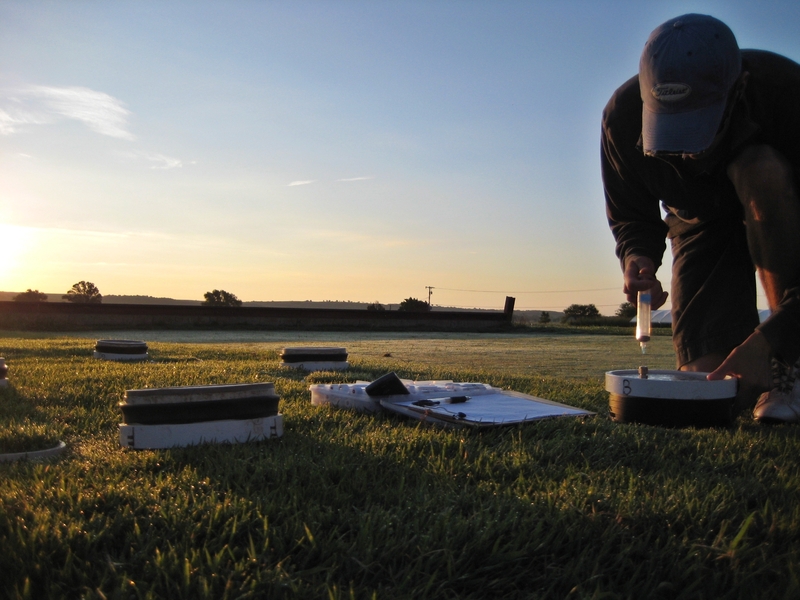 The 2016 Turfgrass Research Reports Now Online! 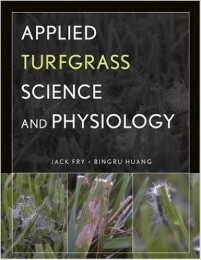 Every year we create new turfgrass research reports. 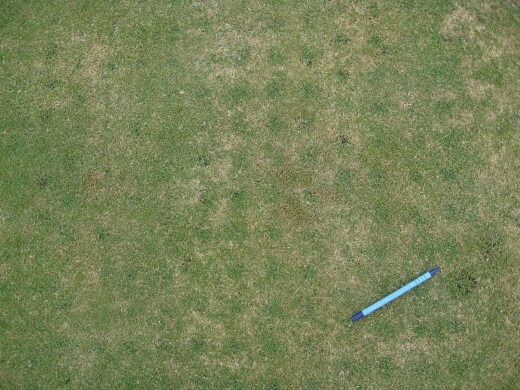 This year we have lots of new information from the release of a new zoysiagrass to unmanned aircraft systems for drought monitoring. Listed below is a list of topics and links to the 2016 reports. Enjoy! Do you have an unwanted weed or a disease that you can’t figure out what it is or how to control it? 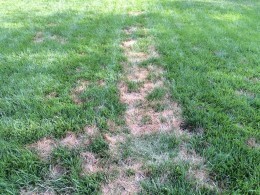 Check out the Lawn Problem Solver at the KSU Turfgrass Website. 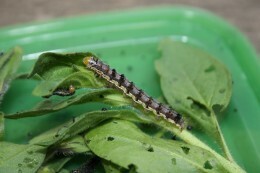 Is has information about how to identify those pesky weeds, diseases, insects and more. Growing bentgrass putting greens in Kansas in summer is like coaching an athlete riding the Tour de France. Actually, it’s even harder because instead of a mere 21 day grind it can be a 3-month grind. In my story here, you are the coach, the turf is the athlete, and the rootzone/soil is the bicycle. 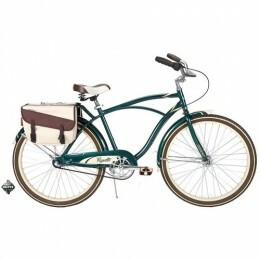 Maybe you are lucky and have a high budget “bike” for your athlete. The bike (the rootzone) was well-built, top-of-the-line, with excellent construction, drainage, excellent sand, etc. The biker (the turf) undoubtedly will still have to work hard, especially in the “mountain stages” (those weeks with high humidity, high temperatures of 100 and lows of 81). But at least the bike itself (the soil) is not going to add to the challenge and make it any harder than it needs to be. It’s what your sponsors are able to provide for your athlete. When your turf is not riding the Tour de France, like when it is growing from September through May, this bike works okay. It gets the job done. However, when the going gets tough (June, July, August), it is VERY tough. 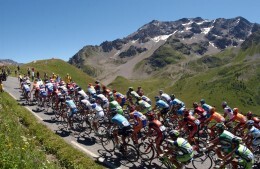 It is VERY VERY VERY tough in the mountain stages. The bike is slow and clunky. The turf is already stressed, and the bike just makes it worse. Like a coach training an athlete for the Tour de France, preparing your grass for summer is a year-round commitment. Build the best bike you can. That is, build the best soil profile you can. Aerify and verticut in the fall. Reduce shade and improve air flow. 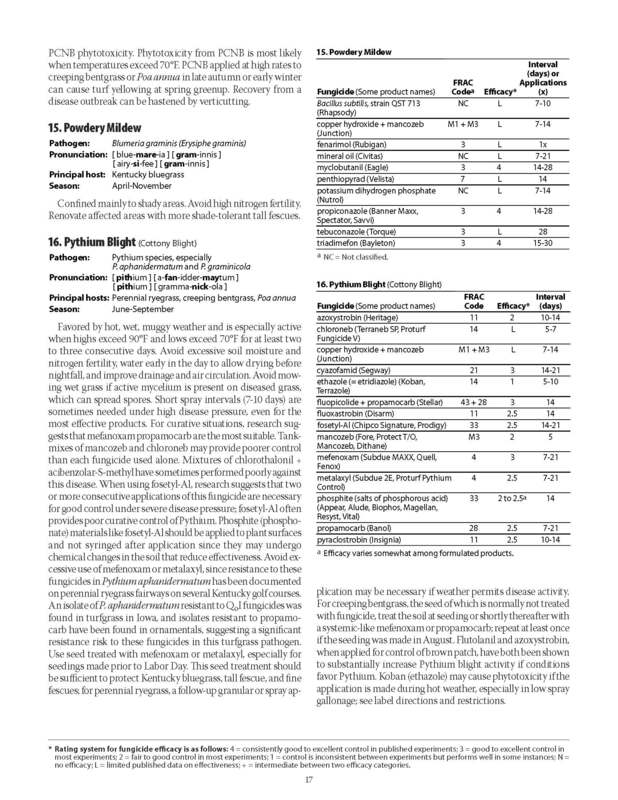 Get on a regular topdressing program. Your athlete needs food, too, not just a bike. Green photosynthetic tissue = food. Raise the mowing height a tiny bit, or roll instead of mowing, or skip mowing now and then. 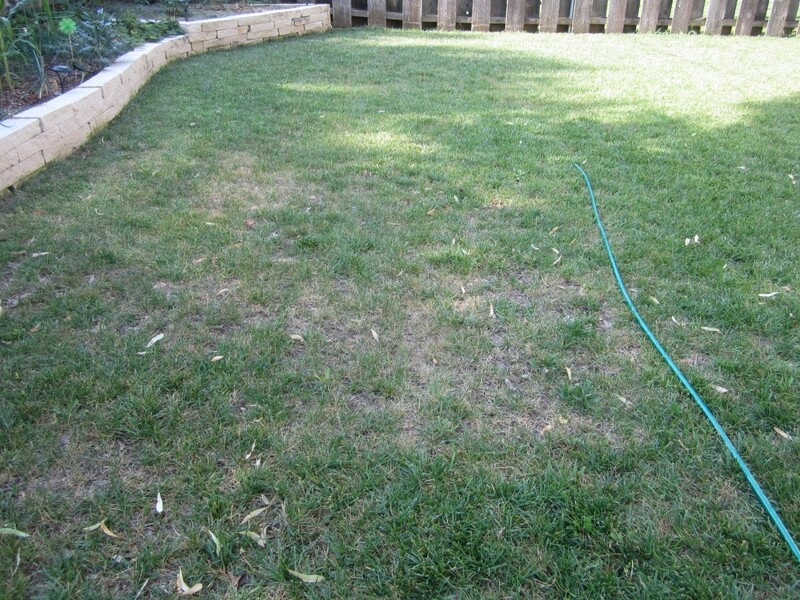 Don’t just do this in summer – consider doing this in spring/fall when the grass is growing. 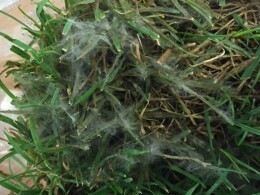 Put down adequate N in the fall, and spoon-feed during summer. 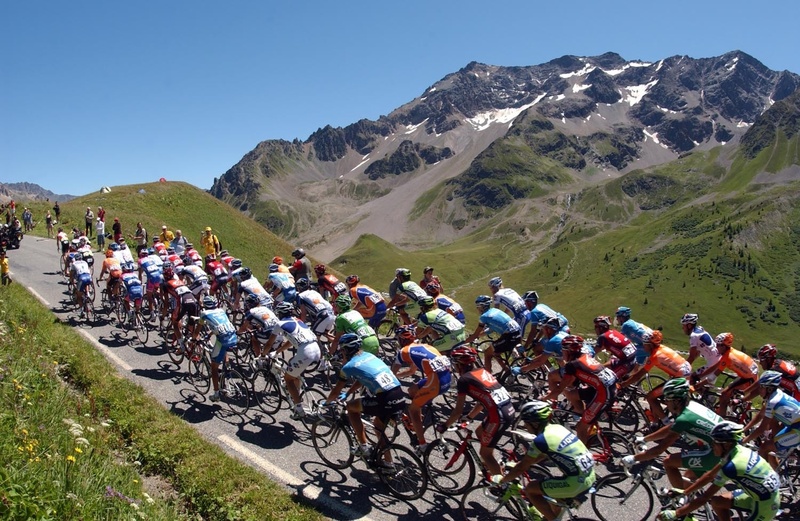 Your athlete can’t ride up the mountain if it is starving. 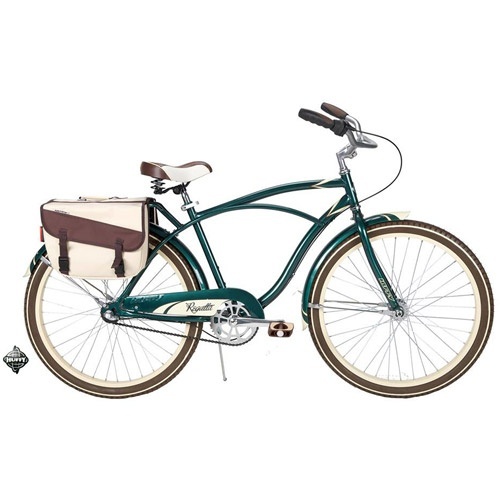 Explain to your sponsors (your golfers/members) that if your budget is a Huffy beach cruiser, they can’t expect that same as with a high budget piece of equipment. Maybe they can increase the budget, and at least get a moderately prized bike (pay for some extra aerification in the fall, buy some equipment to do some needle-tining in summer). Maybe they don’t even know it’s a Huffy, and with some explanation, you can get permission to rebuild some problematic greens. Dig up some cores, show it to them, and talk about drainage, root health, oxygen, etc. Communication is critical. If the athlete is showing signs of stress, get help right away. I know this metaphor was a little clumsy – if you made it to the finish, congratulations! Have you noticed that your geraniums and petunias are not blooming (flowering)? Well, the “critter” or culprit causing the problem may be the caterpillar or larval stage of the tobacco budworm (Heliothis virescens). Or click HERE if the above “read on” link does not work.